John Linde, president of Solid Surface Acrylics, flipped the switch on a back ultraviolet light rod to show how the shiny brown acrylic bar top his factory made could transform, as if by magic, into a fluorescent red, blue, yellow and purple flecked counter. "Isn't that interesting?" said Linde as he stood over a sample of what wound up as decor in a Vancouver nightclub. After 13 years in a business that finally seems to be taking off -- revenues jumped by 40 percent last year -- he has learned to be cautious about the factory he works like an artist's palette. Linde, a former project manager who retired from DuPont Co. to start his own business, found being an entrepreneur was harder than he imagined. The new and steady increase in sales came slowly, after garage experiments and post-Sept. 11 business doldrums that nearly bankrupted him.Now that his company has a reputation for molded tables that can cost half of what others do, and a staff of 26, the setup has let others specialize on marketing and production so Linde, 63, can focus on his creations. Instead of far-out color combinations, he comes up with fanciful, but monochromatic schemes he has learned that most restaurants, bars, designers, architects and home owners favor: gray granite patterns, translucent yellows, a grainy Cream of Wheat look and coppery metallic swirls. The Cafe du Monde, an iconic New Orleans purveyor of coffee and pastries, has counters of white with subtle flecks of brown and beige. The hotel at the Seneca Niagara Casino chose tables with cedar shavings suspended in clear acrylic. "You have to be careful," Linde said of his urge to experiment, "because you get enamored with the technology and you don't make any money." In the years since he founded this company now inside a defunct North Tonawanda grinding wheel factory, his compression molding machines have made counters and tables in curvy or squared shapes for less than the industry norm. While a 30-inch round molded by Solid Surface might be about $150, a similar one, cut and smoothed by a craftsman from a solid sheet, could cost twice that. Even so, tabletops that are tough enough to withstand the high-pressure hose washing at Disney park eateries in California and Hong Kong, didn't catch on as fast as Linde expected. At one early trade show, his booth was so crowded that he and his partner celebrated with a nice dinner. But then the restaurateurs placed no orders. The next year Linde went by himself in a rented station wagon and found one person ready to trust an order with the new company because an acrylic sample left outside all year endured. "They're not going to take a chance on a start-up company unless you prove yourself," said Linde of the lesson learned. "I had no idea how many years it took." This slow rise can be a typical time frame for entrepreneurs, who sometimes do better with assistance in areas outside their specialty, said John Hannon, an associate professor who teaches about entrepreneurship at the University at Buffalo's School of Management. "More often than not it's a 10-year 'overnight' success," he said. "There are no one-man-band entrepreneurs." On the factory floor that has the acrid smell of a nail salon, Linde held a table-sized rectangle in a milky white swirl that was especially thin. It was a new development he created with a customer, as his innovations often are. Its raised diagonal lines on the underside reinforce without heavy thickness. The client was going to make them into a line of easy-to-move patio furniture. Custom order leftovers crowded a dusty side room. A kidney-shaped table in a thick sea-glass green -- used in a juice bar for Goldman-Sachs employees -- had the translucent look that has been a customer favorite. The psychedelic, glow-in-the-dark counter piece nearby, sold only a few times. Yet it did succeed in attracting trade show crowds and the original client. "They aren't afraid to go ahead and tackle wild concepts," said Marvin Wernick of Marvin Industries in Los Angeles. As the inventor of the 1970s fashion fad the Mood Ring -- it went from black to blue when skin was warmest -- Wernick still works on products that react to temperature and light. He developed the fluorescent flecks and hired Solid Surface to make the table tops because of the cost savings and brilliance of the clear acrylic. Molding shapes to size was cheaper than shaping sheet countertop. "You use everything you put into that mold. There's no waste," said Wernick, who is working with Solid Surface on more, yet-to-be disclosed projects. Linde got his business idea to mold clear acrylic while working for the DuPont division that makes the counter surface Corian by the sheet. While Corian, an opaque acrylic, is favored by kitchen planners for its faux granite looks and colorful range, Linde calculated installation costs would drop away with custom molding. DuPont, which has a Corian plant in the Town of Tonawanda, rejected the idea, deciding to stick with mass production. "They're big and they do a good job of making lots of the same thing," said Linde. "Nobody had ever compression-molded a solid surface before." So in 1993 Linde retired to try out the custom order market. A work colleague and project engineer joined him as partner. Linde and Bob Barenthaler, now Solid Surface's technical manager, experimented for nine months in Barenthaler's Snyder garage. They moved the business to 800 Walck Road after a friend told them about the defunct factory that had used compression molders to make grinding wheels. There, on a tour one cold winter day, a consultant flipped a switch and an old hydraulic press started to move. "We were amazed," said Linde. "That press wanted to run." 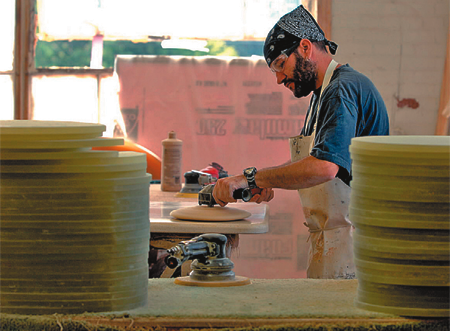 Last year it was among the 10 presses working to mold 8,000 table tops. Inside the 70,000-square-foot factory, the walls are lined with barrels of acrylic colors that look like clumps of sand with grains resembling aquarium gravel. A fine white acrylic dust covers sample rounds sold online as cutting boards. One had a picture of Mount Rushmore, a monument Linde's grandfather and uncles helped carve in his home state of South Dakota. There is a parallel between the Rushmore carving, he said, and his own interest in acrylic patterns and colors that he devises studying the brown shades in the whorl of a seashell or slices of blue agate he keeps in his dusty office in the middle of the factory floor. Linde studied engineering so he'd have the know-how to make things he imagined. Now his job at Solid Surface has left him with no interest in retiring and no time for the hunting he did as a young man that led him to start his career as rifle designer. "Since I got into business that's all I do is work," Linde said. "I'd much rather do something that's creating," he said. "To me it's more enjoyable than building a wood cabin."